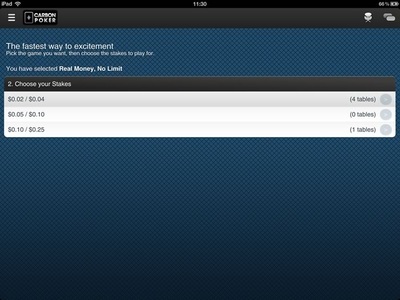 ﻿Carbon Poker is currently the only United States real money poker app for iPhone, Android and iPad. Play Texas Hold'em cash game or fast fold poker from any browser on your smartphone or tablet. Sit & Go tournaments now available. Many Carbon Poker players are reporting problems withdrawing their player funds, so at this time we NO LONGER recommend Carbon Poker as an option for US-based poker players. Ignition Poker WWW.IGNITIONCASINO.EU is currently the our top rated iPhone and Android app for US players. Carbon Poker welcomes United States poker players. Browser based so play on iOS, Android, Windows etc. Play Texas Hold'em cash games and speed turbo poker. 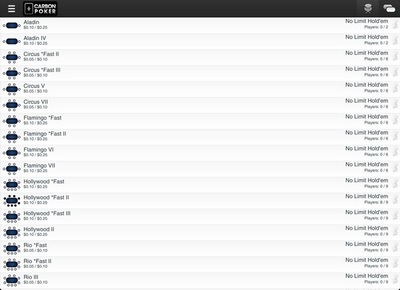 Play Sit & Go tournaments on your phone or tablet. No download needed. 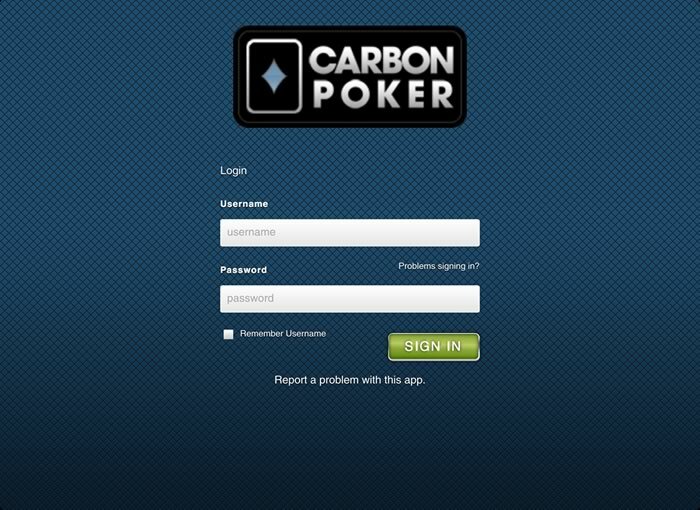 Play instantly at CarbonPoker. 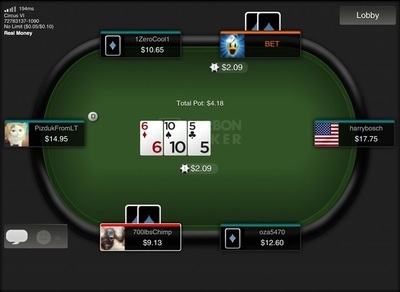 Carbon Poker has been put forward by the Merge Poker network to essentially be there guinea pig in the world of mobile poker. As it’s probably the networks biggest brand, Carbon have been able to produce a first attempt at their poker app as they finally start to compete with other companies who have been established in the mobile poker industry for some time now. What’s interesting about Carbon entering the mobile poker world is the fact that there app will be available to US based players. There poker room has come in for critical acclaim for being one of the very few major brands still allowing access to US players and now they will be able to boast that there app does exactly that. Merge have always been thought of as a pretty forward thinking poker network so it’s a little surprising to see them take this long to get to grips with mobile poker. But they are here now, so ultimately that’s the main thing. What will be interesting is that they have had time to see how other iPhone apps have been produced and essentially take the good parts away from those already established. Carbon have already stressed on their website that the app is very much in a ‘Beta’ phase at the minute and they are looking for input from its users as to ways to improve it. But even from there early days, they have shifted over to real money games already and they report that tournaments will be hitting the app in the not too distant future. By registering a new account with Carbon Poker you will become eligible to receive a massive deposit bonus worth up to $5000. Once more, this bonus will be a 200% match on your opening deposit with the poker room. It’s worth bearing in mind however, that you can’t sign up directly from the app, but it is possible to register on their website directly from your iPhone or of course via your PC. The bonus is based solely around your first deposit amount, and once you have made this deposit you won’t be able to claim a second bonus. Typically you will receive a 90 day period in which you must clear your bonus and any left after those 90 days will become void. It’s also worth noting that if you make any withdrawal before your bonus has finished clearing then you will void the remaining bonus balance. You can check your cashier for more details on how long you have to clear your bonus. The bonus will be released into your account in increments of $10. By earning 150 VIP points at the tables means you will clear $1 worth of your bonus, so 1,500 VIP points will be required for every $10 of bonus. Games played on the app will qualify for the clearing of the bonus. We mentioned earlier about the app still being new to the market due to the fact that Carbon Poker have only recently allowed people to download it via smartphone or tablet device which includes real money tables. The downloading process doesn’t work in the same way most do – i.e. directly from the app store – but instead you will need to visit their site from your mobile browser and then follow the instructions. As you first log in and land into the app you are greeted with a compact, well laid out screen allowing you to jump straight into the games; if you so wish. A choice of stakes and then games can be picked before the table will instantly sit you. If you are new to the app we would recommend spending a little more time getting used to the interface and editing the settings before you dive straight into the tables. The top of the home section allows you to choose between a table search including money type, limits, sort by, which tables to show, setting and a log out button. 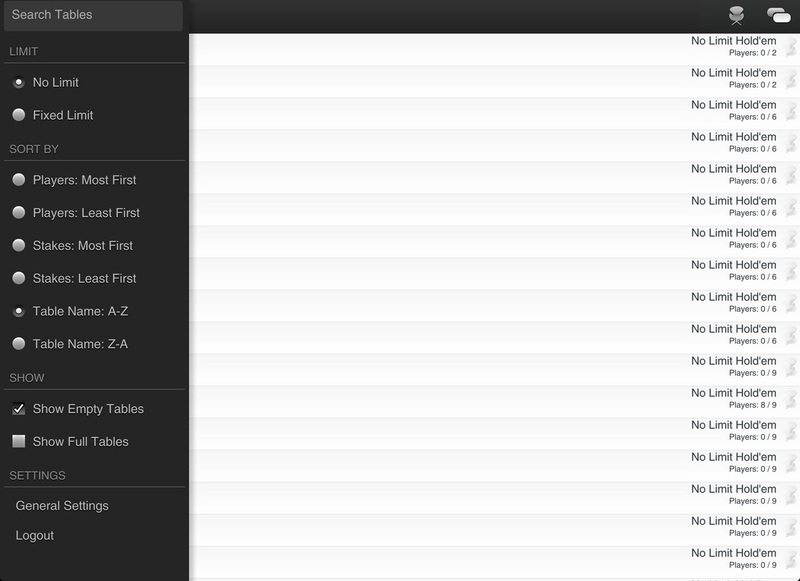 The general setting tab is definitely something you need to head to before doing anything on the app. This section allows you to change a number of features available at the table such as auto folding, coloured decks, buy in amounts, re-buy amounts and more. The next section is the list of games that are running. This is usually a pretty healthy list –depending on time of day – and will include information such as table name, stakes, game type and number of players sat at the table. It will also have a little graphic of the table to show you which seats exactly are free which was a nice, if slightly unnecessary, touch. 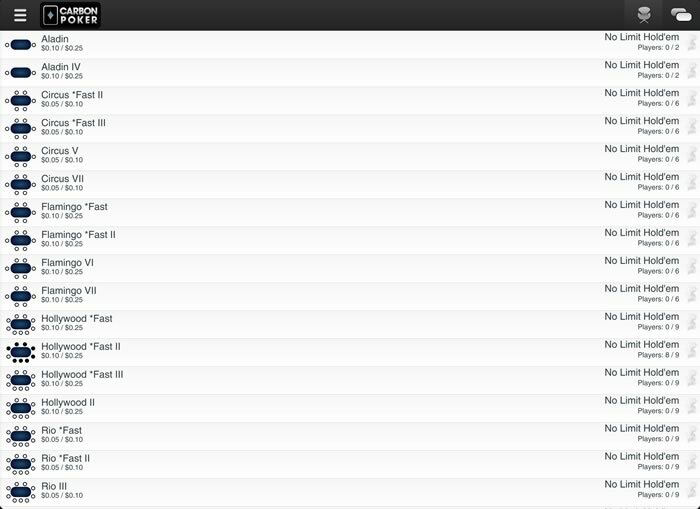 Finally there is a small pin of which you can select to keep certain tables at the top of that list. These are little fiddly to say the least on the iPhone, especially if you have big fingers, but they provide a good purpose nonetheless. 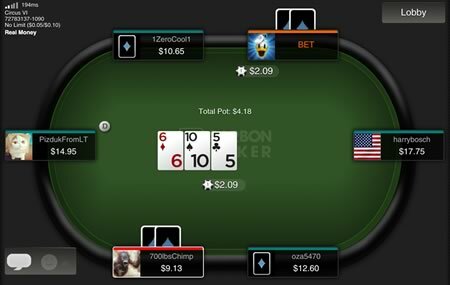 Carbon Poker Mobile offers a variety of Sit & Go No Limit Hold'em poker tournaments. Heads-up, 6 and 9 seater tournaments are available throughout the day. Play at Turbo or Hyper-Turbo speeds if you'd like to see the events finish quicker. The table is probably the biggest selling point of the whole app. It’s basically just one of the best looking iPhone mobile poker tables that we have come across. Often with the iPhone the tables can look cluttered, cramped and very tough to use. But this has almost a minimalist feel to it without ever lacking the functions you need from the table. The games will include a short description of the stakes and table name in the top left corner along with a connection bar signifying how strong your connection is to the Carbon Poker server. Now this is actually something we haven’t come across as to date on any app we have tested and not something we have really thought about being necessary. But the more you think it about it the more brilliant this idea is. So, you can see exactly what the connection is doing and if you see it dropping for whatever reason you can quickly sit out of a hand or at least try and improve the connection. It’s probably the simplest feature on the whole app, but it’s by far and away our favourite. Finally, we really like the option of being able to make the app double check your last decision, especially in bigger hands. At the end of the day we are still on an iPhone where screen real estate is limited at best, so miss-clicks will happen at some point. But this feature almost eliminates them altogether which is mightily impressive. After spending fair amount of time on the Carbon Poker iPhone app we are delighted to report that it’s been a massive success for us. The way in which the tables are laid out and the fact that it’s so editable make it, surprisingly, one of the best we have tested. The addition of Sit & Go tournaments is also a big plus. 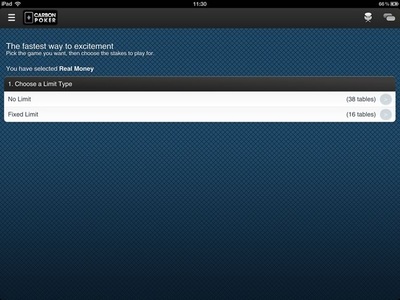 Taking into account and remembering that at just the start of 2013 this app was a 100% play money app with next to no features, just shows how far they have come in a relatively short time. Coupled with the acceptance of US players, we think the Carbon Poker iPhone app will be here to stay.